A strange ancient monument known as the Falicon pyramid is located at a rural site near the town of Falicon, near Nice on the French Riviera. It’s one of a few pyramids in Europe. Mysterious ancient equilateral structure – perched on a rocky ridge in an area of rugged gorges, forests and hills – has the same name as a very ancient village, located only two kilometers from the pyramid. Falicon Pyramid has a complex and rather mysterious history. The pyramid – located above a karstic cave known as the “Cave of the Bats” (Grotto of Ratapignata ) on the eastern flank of the ridge – is constructed of small irregularly-shaped stones and is in rather ruined condition. While most of its upper section is missing, the lower section is well-preserved. For what purpose was the Falicon pyramid built? What exactly inspired the unknown stone masons to build this structure in rather inaccessible mountain range of the so -called Maritime Alps, in the south-western part of the Alps, at an altitude of 430 meters? Why was it raised in such inaccessible place? Where are the underground tunnels beneath the village of Falicon leading? It is a place, where “time stands still” giving the impression to be totally isolated from “civilization” pulsating just about 10 km from the center of Nice. Beneath very old houses, there is a network of arched prehistoric tunnels. Perturbations in the orbit of Uranus let astronomers discover the planet Neptune in 1846. Now this same technique has been used to find a planet 1,000 light-years away. For the first time, astronomers have confirmed an unseen planet in a distant solar system thanks to the gravitational perturbation it was causing on another planet in that system. A perturbation is just a deviation in the movement of a planet, caused by the pull of gravity from an outside influence. Perturbations in the orbit of Uranus let astronomers discover the planet Neptune in 1846. Neptune is in our solar system, relatively nearby. The Kepler-88 system is over 1,000 light-years away. This is the first time astronomers have confirmed the presence of an exoplanet – planet orbiting a star besides our sun – using this technique. The newly confirmed world is now called Kepler-88 c. It was causing minor shifts in the orbit of its brother world, Kepler-88 b.
Astronomer Alexandre Santerne of the Centre for Astrophysics at the University of Porto in Portugal led the work. 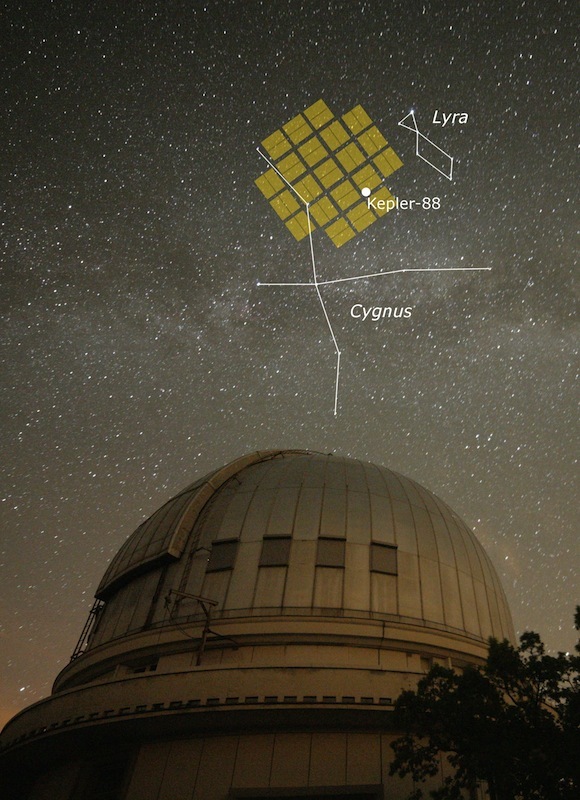 He and his team used the SOPHIE spectrograph at the Observatoire de Haute-Provence in France to measure the mass of Kepler-88 c, thus confirming that it exists. This system presents such strong interactions that it has earned the nickname of the king of transit variations. David Nesvorny of the Southwest Research Institute had previously performed a careful analysis of the dynamical interaction between the known planet and the hypothetical, unseen planet. This work helped to put tight constraints on masses of both planets, thus suggesting a location for the unseen planet. SOPHIE is a French instrument capable of measuring the velocity of stars with a precision equivalent to the speed of a bicycle. It has been used to characterize nearly 20 Kepler planets so far. 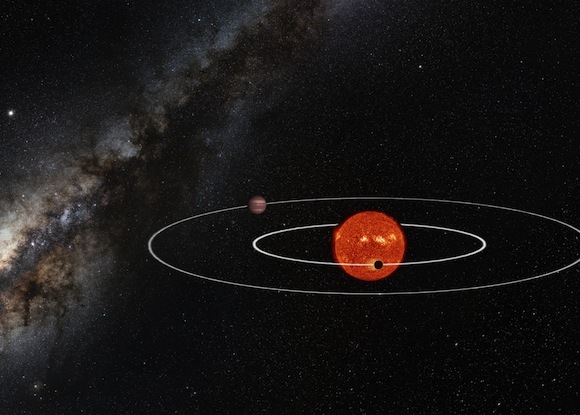 The inferred mass for the unseen planet is in agreement with the value that was predicted, making this the first time that the mass of an unseen exoplanet – inferred based on transit timing variations – is independently confirmed by another technique. More than 3,500 of such periodic transits were found during the 4 years of the mission. However, not all the planets located in the Kepler field-of-view are transiting their host star. Indeed, if their orbital plane is slightly misaligned (only a few degrees is enough) with the line of sight from the Earth, the planet is not transiting and, thus, is “unseen” from the Kepler spacecraft. Planets that share the same host star gravitationally interact with each other. This interaction between planets can cause perturbations in the predicted times of transit of planets in multi-planetary systems. Ultimately, these perturbations in the predicted times of transit may prove to be another powerful technique for finding and confirming planets in distant solar systems. Bottom line: In 1846, Neptune was found because it was altering the orbit of its neighboring world, Uranus. Astronomers have now used the same technique to find a planet in a distant solar system. The following article, posted by Message To Eagle, describes the bizarre events that occurred in France, when spiderweb-like fiber particles fell from the sky. Up to the current day, no valuable explanation has been found to the phenomenon. However, the stroy reminds one very much of the phenomenon of the Morgellon syndrome. A strange, thin white substance falling from the sky has created a debate in France. Puzzled and frightened residents called the police and firefighters to examine the mysterious substance. Now people ask – what are those long, silky strings floating in the air? The substance was observed for the first time on Thursday by residents of the Drome and Ardeche, France. It was unclear whether the unknown material falling from the skies was toxic, but an analysis was not requested by authorities. The substance is very similar to what is called “angel hair”. Unfortunately, very little is known about “angel hair”. This aerial anomaly is delicate, glittery, white and hair-like in its appearance. Angel hair is often associated with UFO sightings. Over the years, their have been a number of reports of falls of angel hair around the world. There are very few samples of this higly unusual substance. The substance is very difficult to examnine because it melts when you touch it. However, angel hair is only one explanation that has been put forward. There are also other hypotheses. Some believe this could be chemtrails. Scientists have suggested that the mysterious filaments rain that fell on Thursday was created by spiders. Such spider webs are used by spiders to handle wind and move from one place to another. Similar spider webs were discovered earlier this year in Texas. According to scientists such spider webs occur when weather conditions change dramatically or when spiders migrate to better hunting grounds. They’re called “ballooning” or “floating” webs made by young, migrating spiders. “There’s some that produce a ball like a balloon, and there’s some they call tent spiders because they create almost like a triangle,” according to Texas A&M Agrilife horticulturist Patrick Dickinson. The Fukushima incident is possibly responsible for a mass dying of animals all over the Pacific Ocean. Radiation in and around Fukushima is much stronger and its impact on the environment much worse than prospected and officially reported. Nuclear waste containers have been discovered to be leaking and release radioactive material into the environment. Nuclear waste remains hazardous for almost 1000 years. The containers that contain the radioactive waste material, last all much less. Can we at all respond to the possible catastrophic effects that have been caused by nuclear power and might in fact be caused in the future? How can we at all foresee which dangers we may be going to face? France for example gets most of its power supply out of nuclear power plants. But France is also a country that is located over a rift that could show an important seismic activity in the future. On the other hand, Russia has ambitious projects for nuclear power plants. And while Germany has started to turn off its reactors after the Fukushima incident, nuclear power plants are being built allover the world, regardless of the disastrous consequences in case of an accident. The problems of nuclear waste are being concealed and played down, and nuclear power is being embellished by those who earn on it. The energy problem remains unsolved. There’s still no real clean energy supply, as windmills and solar energy panels create new problems for the environment. The promotion of all alternatives to mineral oil is being performed by those interested in making a business out of it, helped by arguable affirmations about man-made Global Warming. The production of energy in modern times has been a time bomb since the invention of electricity. Mineral oil has turned out to be a solution as disastrous as coal for what concerns direct pollution. Nuclear energy is being heavily criticized, yet power plants are being built everywhere in the world. What is missing is a serious worldwide government-financed investigation for the development of alternative energy production like proposed i.e. by Nikola Tesla. Has anybody ever wondered why windmills and solar power plants have become a big business, but no government performs officially serious research about i.e. Tesla’s ideas? Compare the worldwide distribution of power plants (1) with the map showing the seismologically unstable and most dangerous aeras on Earth. 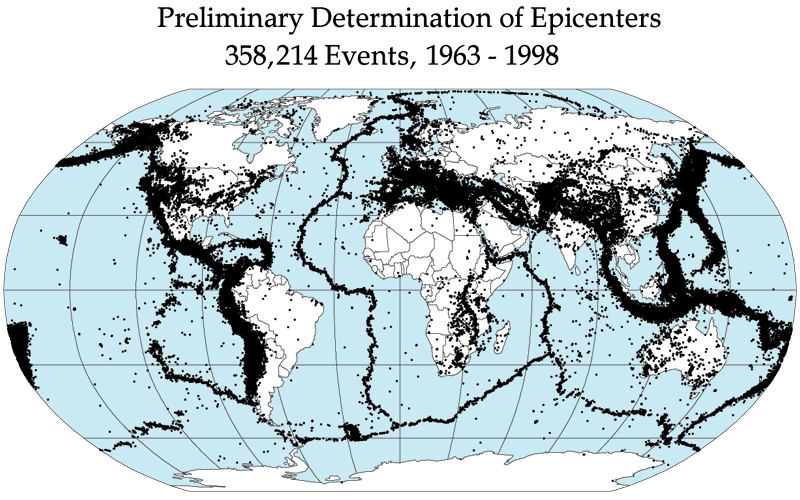 Earthquakes are still almost completely unpredictable; leave alone the eruption of volcanos or super volcanos. These events alone can be disastrous – if they trigger a nuclear catstrophe, the effects are unimaginable. Nuclear energy is no solution as the price the planet pays in case of an accident, is incalculably high. We need valuable research for other solutions – otherwise, we might be the ones who will have killed life on Earth as we know it.